People often think that stereotypes are made by another race and their view of the race they are labeling. But what most don’t think about are the labeling and divisive stereotypes that are used within a race; such as stereotypes often used in the Black community. This type of division in a race can be poisoning and indirectly divisive. Stereotypes such as Light Skin Vs. Dark Skin within the Black community are cancerous, dangerous, and shape how we view ourselves and our people. Fortunately, we can solve this problem by teaching and mentally reshaping how we’ve been trained to think and behave. This stereotyping is seen as joking and not serious, at least that’s what is thought. It is also rare that anyone questions where Light Skin Vs. Dark Skin originated. “It just exists, and it is somewhat passed on. … Even young children use these jokes and labels.” But the question stands where did it get its beginning and how was it enforced? Light Skin Vs. Dark Skin emerges at least as early as 1712 in the Colony of Virginia on the banks of the James River and Willie Lynch. Willie Lynch spoke of ways to break apart the tightly unified Black man and woman. The unity between the slaves led to revolts. They killed their owners and those families and often ran away. Considering this, Willie Lynch devised a plan that would control the slaves physically and mentally for 300 years or more if executed correctly. Furthermore, he suggested destroying the mother language of Black people, and he wanted to limit the understanding of the English language. “Being a fool is one of the Basic ingredients of any incidents to the maintenance of the Slavery System,” said Lynch. By making us foolish, small differences like color shade could be used to break our unity—thus creating light skin verses dark skin. Willie Lynch’s plan ultimately was to take the small differences between Blacks and make them bigger. Lastly, he has to use a method to instill these differences among Blacks. Additionally, Willie Lynch had principles for breaking apart unified Black people and turning them into foolish slaves. He used fear as one of the mentally bonding chains. He suggested taking the strongest Black male, tying his arms and legs to two horses, lighting him on fire and making the horses run into two different directions. He would then make the pregnant women, children, and slaves watch to instill this fear. He would then take another strong Black male and whip him to near death, but not enough to kill him. The pregnant women would pass this fear off on to their offspring and the children would have this image engraved in their brains. It was breaking the strong image of the Black male; making the woman independent of him. The male children would be made strong physically but weak mentally. This process aided in allowing differences to become problematic; those differences have created a rift within the Black race. Such differences and inequalities also manifest in the work place, the criminal justice system, socioeconomic status, and education. “According to research by Arthur Goldsmith, Darrick Hamilton, and William Darity, employers tend to prefer light-skinned Black employees over dark skinned black employees,” noted one source. “Similarly, research by Jennifer Eberhardt, Paul Davies, Valeries Purdie-Vaughns, and Sheri Lynn Johnson demonstrates that ‘blacker-looking’ African American males are more likely to receive the death penalty compared to their lighter-skinned counterparts for comparable capital crimes,” noted other experts. These inequalities have shown up in socioeconomic status, and education. For example, “Light skin attains a higher socioeconomic status in its own right, through greater education and workforce mobility,” according to research on Colorism. This “anti-Black” bias is evident in beauty standards and has caused self-hatred within the Black race. Beauty is measured by how White one looks. During an experiment in 2010, three psychologists found Black children chose a White doll and associated the White doll with good characteristics over the Black doll. Also the Black doll was associated with bad characteristics. The age group was 4 to 5 and 9 to 10; at such ages how do they know that Black is ugly? What images have they been shown that would make them believe that Black is beautiful? 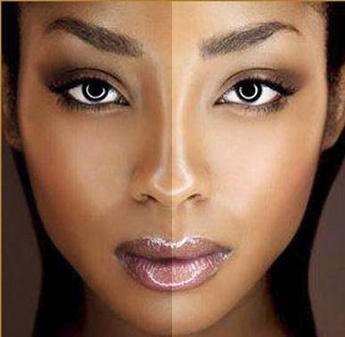 “Studies show that non-whites tend to embrace the beauty standards prevalent in most societies, which grant a higher desirability to lighter skin than to darker skin,” noted an author on Colorism. Why is that? It has also come into the light, that Black celebrities are bleaching themselves. Some of the most notable Black celebrities accused of bleaching are Sammy Sosa, Rihanna, Beyoncé, and many others who are not famous use dangerous skin bleaching creams. But why, what and who have convinced them that their skin wasn’t beautiful when it was brown? Unbeknownst to them this self-hatred has been indirectly affecting them. There is a solution to this Light Skinned-Dark Skinned problem and the issues that come with it. The solution to this problem is simple: Educate Black children at an early age about history and how race mixing was used as a weapon of mind control. Once they understand this, all the other issues such as self-hatred and the divisions are erased. This is the only way to ensure these mental chains are broken. Light Skin Vs. Dark Skin was created through a process. So education has to reverse that process. This teaching will have to be instilled into young children at an early age all the way into adulthood. Once these teachings have been correctly executed, the process that Willie Lynch instilled in the Black race will be broken completely. There will be a new enlightenment in the Black community and there will be more progress as a race. Self-hatred will be a thing of the past. The inequalities that exist because of divisions made by our ignorance will be no more. The Black race will be unified and strong like it once was before our enslavement.